Cannot be Normal Summoned or Set. 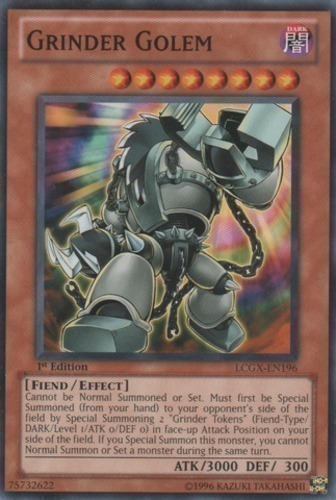 Must first be Special Summoned (from your hand) to your opponent's side of the field by Special Summoning 2 "Grinder Tokens" (Fiend-Type/DARK/Level 1/ATK 0/DEF 0) in face-up Attack Position on your side of the field. If you Special Summon this monster, you cannot Normal Summon or Set a monster during the same turn.